Be sure to check out our "Common Misumptions" page as well. Sometimes I see "G_d" written by Masons instead of the complete name of the Deity. Why? Actually, it's not only writings by Masons where you'd see this. Many Orthodox Jews will not write the Name of Deity in full in any place other than a liturgical usage for fear that the paper on which it is written might be destroyed in a manner that would constitute profanation of the Name, in violation of the third Commandment. Because Masons take their religious obligations seriously, those Masons of the Jewish faith may do this in a much larger percentage than the general population. Why do Masons call non-Masons 'Profane'? This is a misunderstanding over archaic language. The word comes from two Latin words, "pro" meaning 'before' and "fanum" meaning 'temple'. In its earlier usage, the word "profane" was used literally and meant "outside the temple", as an opposite of the word 'sacred' just as we now use the word 'secular'. In more recent usage - and well after the language of Freemasonry became somewhat fixed, the term was usually coupled with the word 'language' to describe speech which was not appropriate to be uttered inside a temple or other sacred place. It's usage further changed so that it became a synonym for cursing and blasphemy: that which we now refer to as 'profanity'. When a Mason refers to 'profanes', however, he means only those not initiated into Masonry using the ancient usage: a person who must remain "outside the temple". No insult whatsoever is implied. What are those three dots arranged in a triangular pattern? The three dots (or three points) were formerly fashionable in Masonic writing instead of the usual periods after initials. The practice was apparently started in France by the non-recognized Grand Orient of France in 1774 and Masons were sometimes called 'Three Point Brothers'. The usage became popular in the US and is seen today in some Scottish Rite documents. Any significance they had two hundred years ago is now long lost. Why are Masons involved in laying the cornerstones of buildings? Are all members of Masonry taught 'operative' masonry skills? Because Freemasonry is non-sectarian and the heir to the historical tradition of building, is the appropriate organization to dedicate the cornerstone of a public edifice. Of course, many churches invited the Masons to solemnize their cornerstone laying, in addition to the religious ceremonies. Some Masons wear their rings with the compass points facing outward while others wear theirs with the compass points pointing toward them. What's the significance of each? There is no proscribed manner but for many, there are subtle allegories to which they attach great meaning. As one example, some brethren have said that to wear the ring with the points out, toward the finger tip was to proclaim to the world that a person was a Mason. To wear the ring with the points in, toward the wrist was to remind the wearer that he was a Mason. In these instances, there is sometimes an additional admonition that one wears the ring with the points in until the wearer no longer had to be reminded of their Masonic obligations - and thus those who've received this admonition most likely wear their ring with the points inward still! There are also some who'll say that one wears the ring as he last saw the Square and Compasses: if a Master or Past Master, it would be with the points 'away' from the wearer as his duties would require him to be 'behind' the altar thus looking from top to bottom. Who knows? How the ring is worn is not nearly as important as what it means to the wearer. A Mason should wear his ring should with pleasure to himself and honor to the fraternity! 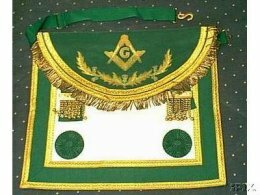 What are those aprons, funny hats, and metal collars and badges Masons wear? Like any organization, Masons have various badges of rank and honor. Each has a different and distinctive meaning. The various accruements will also depend on the Masonic body being represented. Still further, there are unique differences based on geographical history and sometimes even personal desire. If you have a question you'd like us to answer on this page, just drop us a note! Thanks.